The Puma TitanTour golf shoe is designed to be the “coolest” shoe in golf, in more ways than one. It’s cool enough for Rickie Fowler to rock on the course and it’s designed to keep your foot cooler. Temperature regulation in a golf shoe? That’s right! It’s done by using creative space-age technology. The Puma TitanTour golf shoe is the first ever shoe with an outlast memory foam that’s designed to find the ideal temperature. This technology was originally developed for NASA’s space program as a temperature regulation technology. Excess heat is absorbed by the Outlast coating on the Puma TitanTour memory foam insole, creating a noticeable cooling effect on your foot. And if you get to cool, the Outlast is smart enough to release stored heat back to your foot. Not only is the technology “cool”, it’s proven to reduce fatigue. This is especially important coming down the stretch trying to finish out your round with as many birdies as possible! The outsole of the Puma TitanTour golf shoe features a PowerFrame that’s designed for lightweight strength and durability, increased flexibility and superior traction – everything golfers are looking for. 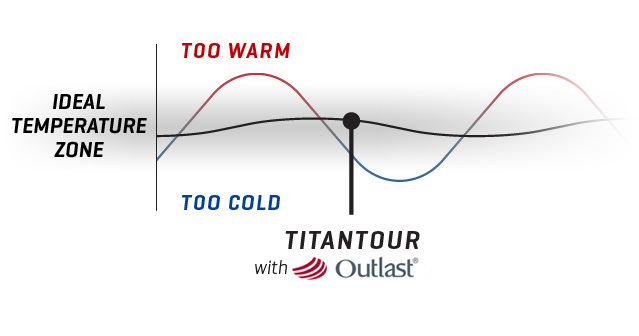 The TitanTour also features an all-new stealth cleat which features a low-profile construction with long-lasting resistance in mind. Another technology feature is the Power Vamp, which allows the golf shoe to offer the best of both worlds when it comes to support and flexibility. The most well-known PGA Tour player representing Puma is Rickie Fowler. He was the 2010 PGA Tour Rookie of the Year and has become synonymous with wearing orange on Sundays. Rickie had an impressive 2014-2015 campaign, featuring top-5 finishes in all of the majors. As he continues to refine his game, with the help of Butch Harmon, this could be his break-through year! Other notable PGA and LPGA Tour players include Jonas Blixt, Graham Delaet, Will Mackenzie, Lexi Thompson, and Blair O’Neal. Want to see what’s in Rickie Fowler’s Bag? Check out the Cobra Fly-Z+ line-up. Emmett Brantly has been a Class “A” member of the PGA of America since 2003. He graduated from Campbell University with a Bachelor’s Degree in Professional Golf Management. He has worked in Public, Semi-Private, Private, and Resort golf facilities in Raleigh and Pinehurst North Carolina. He has also worked in various retail settings, as well as holding positions of PGA Teaching Professional at various academies including the Pinehurst Golf Academy. Emmett has a strong passion for growing the game of golf by displaying his extensive knowledge in club-fitting, teaching, fitness, and product knowledge.